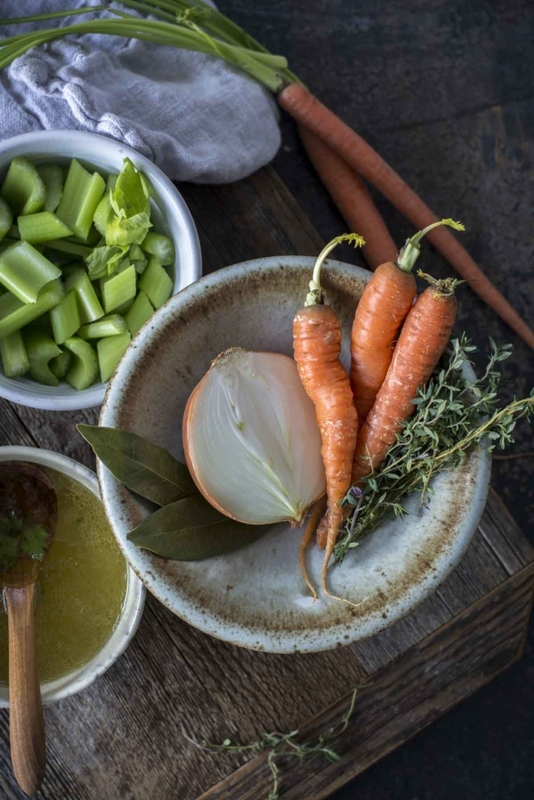 So, what’s so great about bone broth? 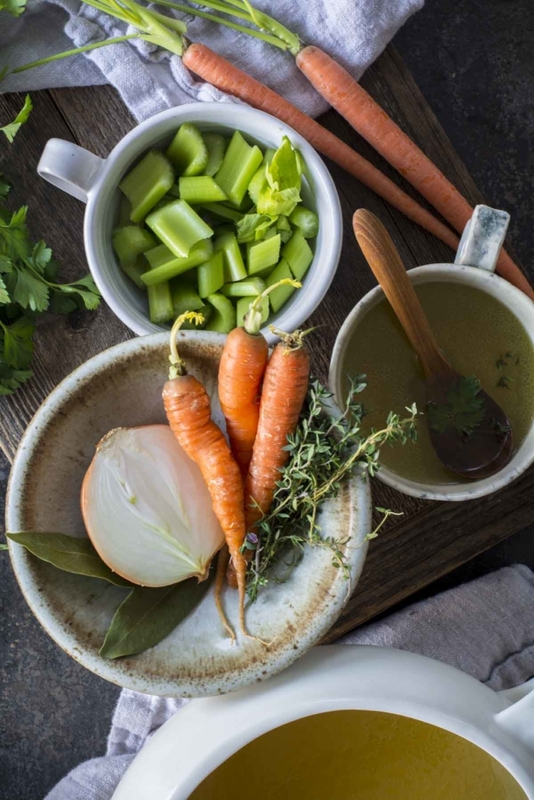 Bone broth is full of vitamins, minerals, and amino acids and helps heal gut issues. Healing instant pot bone broth is ready to sip in less than 2 hours start to finish. Opposed to traditional simmering for hours. I’m afraid I binged on rich and fabulous foods over the Holidays. My guts are in need of healing and cleansing. 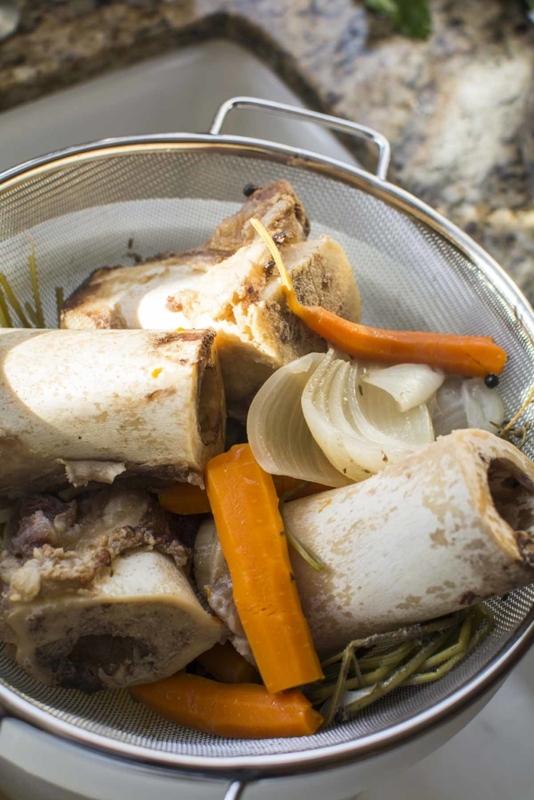 Bone broth is a nutrient powerhouse and is easy to digest. I remember my moms vegetable soup always starting off with beef soup bones. She would simmer the bones in a large pot all day with onions, celery, and carrots, salt, and pepper. Little did I know her soup had magical healing powers that come from the slow simmer of beef or chicken bones. I didn’t realize her soup was loaded with collagen and gelatin which is great for gut healing support. Today I can crank out several batches of broth in a day with an Instant Pot or electric pressure cooker. One tip I have learned about making bone broth is…Garbage in. Garbage out. Use the freshest ingredients you can buy or grow. Use of fresh, organic ingredients. I recently dug these carrots that were left in my garden after fall clean up. Utah is missing its usual blanket of snow. They look a bit hammered, but they are so sweet. 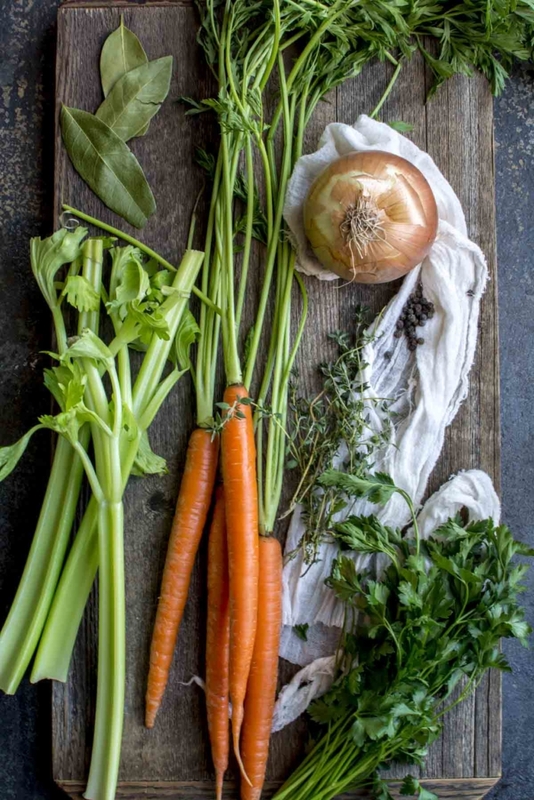 You can use parsnips, leeks, fennel bulb, sage, rosemary, carrot tops, etc. I use grass-fed beef bones. These four bones weigh in at about 4.5 lbs. Roast bones for flavor. Place the bones on a baking sheet and bake in a 375F degree oven for 20 minutes. Remove from oven and allow to cool slightly. Toss everything into the pan of an instant pot or electric pressure cooker. Barely cover the bones and veggies with filtered water. Don’t forget to add that raw apple cider vinegar. This will help pull the nutrients from the bones. Place lid on the instant pot. I used the “manual” method then adjusted the timer for 90 minutes with high pressure. Now just walk away and wait for the magic to happen. One the 90 minutes of cooking is complete, allow for a natural release. This can take 20-30 minutes before you can remove the lid. Strain the broth through a fine mesh strainer. Sometimes I want a nice clear broth and I strain through a couple layers of cheesecloth. You can discard the bones and veggies if you want. This is what I do…I put them all back into the pot add more fresh veggies and herbs. Cover with water then let it cook another round. I will do this 3 times. The first batch is much more gelatinous and rich. Each consecutive batch becomes a bit weaker. Sometimes I like a milder broth. I mark the lids with what number the batch is. Beef broth #1, Beef broth #2, or Beef broth #3. I’m clearing out all plastic containers from my kitchen so I use quart glass jars. However, glass can break in the freezer. It’s just awful to lose a batch of broth because the glass broke during the freezing time. 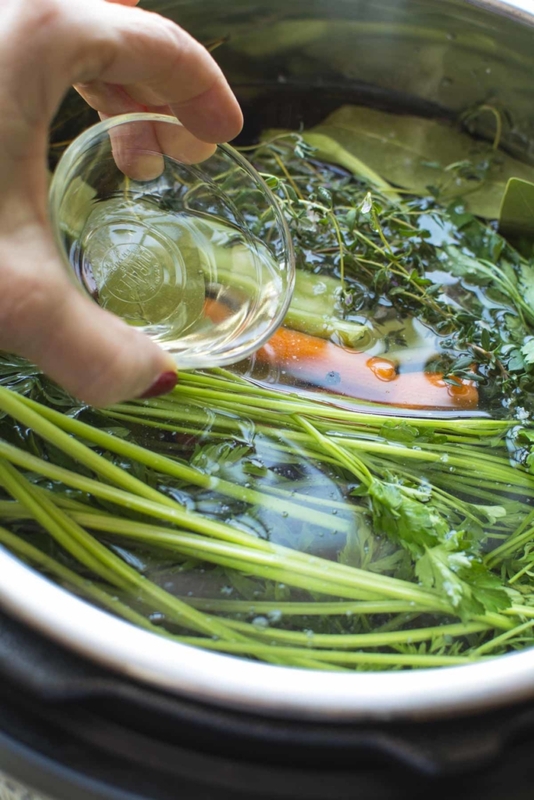 Allow broth to cool completely before pouring into clean jars. Only fill jars 2/3 of the way full. Why not 3/4? Better to be safe than sorry. Refrigerate the jars overnight before placing in the freezer. After the broth has sat overnight in the refrigerator it is easy to remove fat that will solidify. However, if you want more gut healing power, leave it. I have not had a jar break using this method. Right now I have 23 quarts of broth in my freezer. They are a mixture of beef broth, chicken broth, and vegetable broth. I love them all and rarely purchase canned or boxed broth. Nutritional information was difficult to calculate. 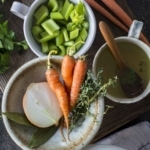 Homemade bone broth does not have near the sodium content as purchased broth. I only add about 1 teaspoons of salt to start. I add salt as needed in recipes. 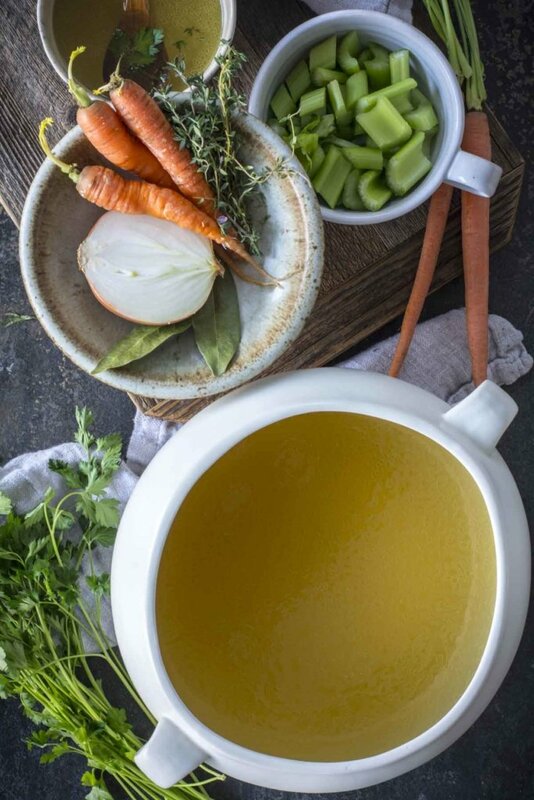 Most bone broth only has about 20-30 calories per cup…fat removed. Heat oven to 375F. 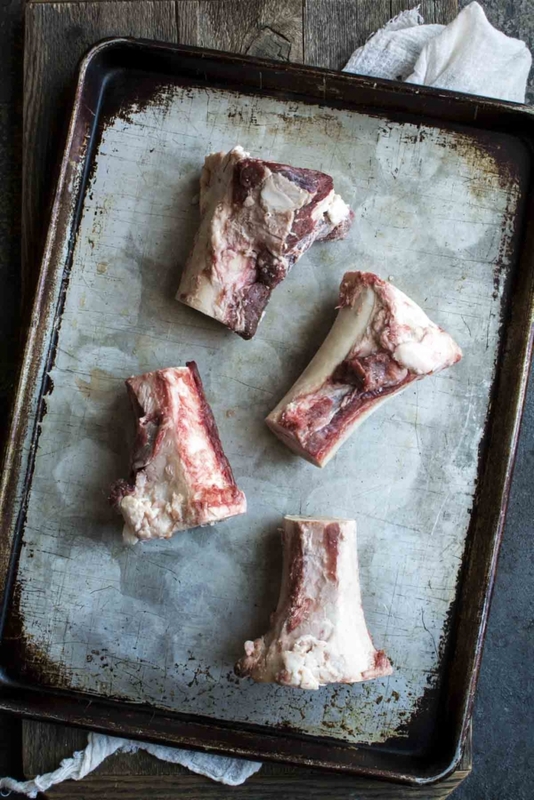 Place beef bones on a baking sheet. Bake for 20 minutes. 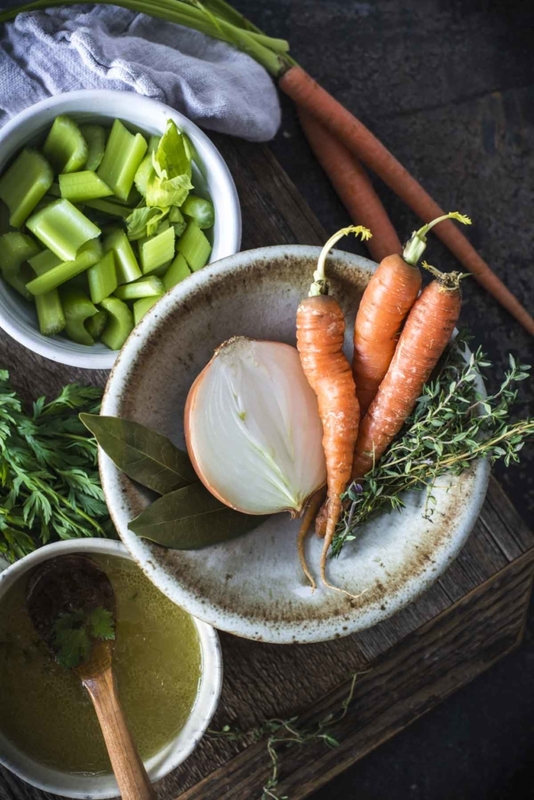 Place browned bones, vegetables, herbs, vinegar, salt and peppercorns in instant pot. Pour filtered water over until barely covering ingredients. Using manual button on instant pot and high pressure cook for 60 minutes. Allow to release naturally. Allow to cool for about 20 minutes. Carefully strain broth through a fine strainer. Pour broth into quart jars and refrigerate. Broth can be frozen after it has completely cooled. Makes approx. 4 quarts of broth. Pho Beef Broth add: 1 star anise, 3 cardamom pods, 1 clove, 2-inch cinnamon stick, 2-inch piece of ginger (roasted, if desired). Thai Broth add: 2-inch piece of ginger, 2 lemongrass stalks (light parts only), 3-4 kaffir lime leaves, fresh turmeric, lemon zest and green onion tops. I’m new to bone broth making. I have a whole raw organic chicken, not just the bones. I’m wondering where to start when this is the case. Hi Amy, A whole chicken will work just great. I just drop the whole chicken into the pot with veggies. The breast meat can overcook a bit. You can remove the breast meat after cooking 1/2 of the time, if you want. 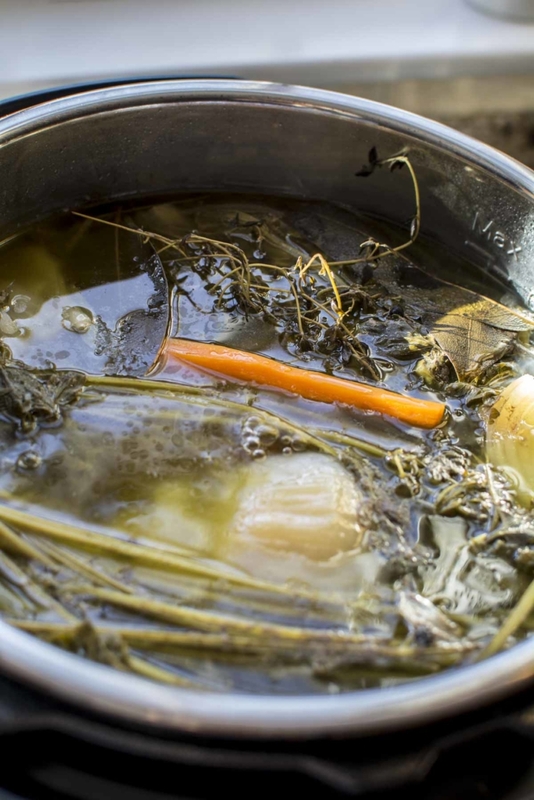 Other than than it’s a great way to cook a whole chicken and get fabulous bone broth at the same time. I have been making old fashioned broth for 25 years. i add organic egg shells for extra calcium. but i would like to know if the instant pot can make an equally nutritious broth? i’m not sure you can draw out all the nutrients in the same way as simmering for a day or so. no one compares the two broths. do you know? i learned i have a histamine problem and my beloved broth is a super high source of histamine and msg(yes,the homegrown version of msg).would you do the vinegar soak then continue with the instant pot method? Great question, Jenn. My daughter also has a histamine problem along with many other gut issues. She has done a ton of research on the matter and I contacted her to help answer your question. Just know that there are so many contradicting opinions out there. This is what she has determined: According to her research the fact that an instant pot cooks at a lower temperature and the heat of the steam, the instant pot actually retains more nutrients. She processed her bone broth for 30 minutes using just bones and 60 minutes if she was using raw chicken…like a whole chicken. The downside is that the broth is not as gelatinous, but doesn’t have as many histamines. I generally just add a couple of tablespoons of vinegar to the pot while simmering. Is it best to soak the bones in the liquid for a longer amount of time? I hope this is helpful in any way. Can this be made in a crockpot? I dont have a pressure cooker. How long would you simmer it that way, and would you suggest high or low temper? 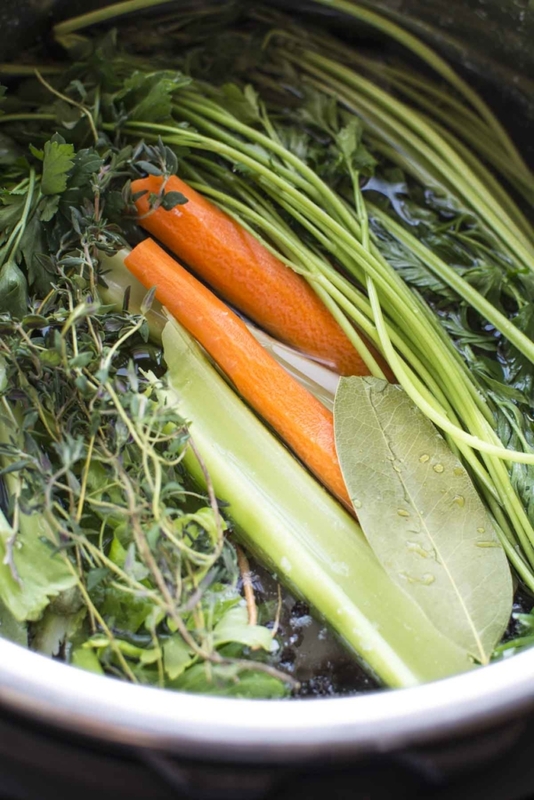 A crockpot makes beautiful broth. I like to simmer in a crockpot 8-10 hours on a low temperture. You can easily go as long as 24 hours. Best of luck.